A new book, Access Denied, The Practice and Policy of Global Internet Filtering examines the mechanisms, politics, and contexts of Internet censorship. The Web provides everybody with access to information. That makes those in power nervous. Transparency is the best defense against further narrowing of information access and the starting point for rolling back existing barriers. 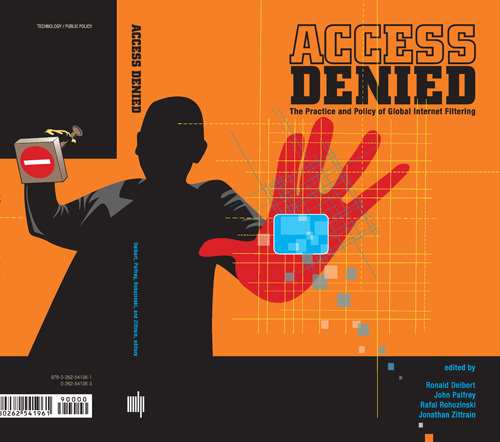 Access Denied provides the definitive analysis of government justifications for denying their own people access to some information and also documents global Internet filtering practices on a country-by-country basis. This is timely and important. This is definitely on my to-read list. It wont matter how crazy delicious our newfangled, web-two-point-oh, citizen-journalizmatic blogonews projects are if folks can’t read ’em. Found on BoingBoing – home of the definitive guide to defeating censorware.